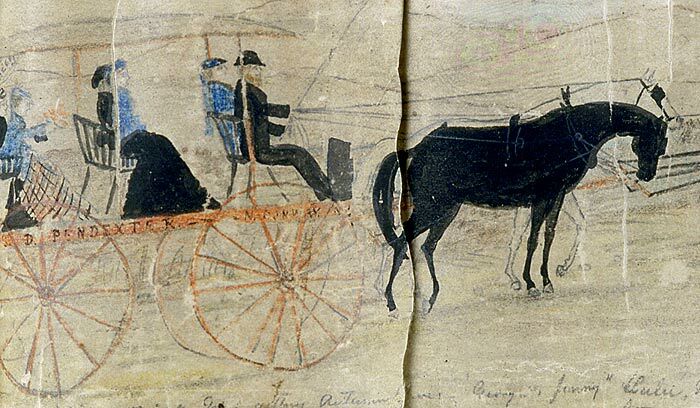 One of twenty-one frames composing a panoramic scroll which records a trip to the White Mountains by eight young men and women from New York in 1875; drawn by an unidentified woman in the group. New Hampshire Historical Society. Starting from Center Harbor . . . at the head of the lake, the regular stage-coach for Conway and the mountains is soon among high hills. . . . One watches the great hill-tops come up, like billows, one after another, from the sea of mountains round about, as the coach winds and twists among them. . . . One may not know the names of many of the mountains, but the peak of Chocorua, sharp and proud, crowns the view whenever the stage comes upon a bluff of height sufficient to overlook the landscape; and, after passing through a wood, it is always that lonely summit that rises first to the view when the stage emerges again under the open light of the stars. For most early travelers to the White Mountains, Chocorua was the first prominent and identifiable peak they saw. All the main roads toward Conway—whether through Concord, Dover, or Portland, Maine—converged in sight of this landmark. Mount Chocorua, noteworthy for its bare, craggy summit, assumes a different appearance depending on the viewer’s perspective. Many travelers would have been familiar with the tale of the Abenaki chief Chocorua through having read guidebook descriptions or having seen the print, “The Death of Chocorua,” after a painting by Thomas Cole. One of the last Native Americans living in the area in the early eighteenth century, Chocorua maintained a good relationship with nearby European settlers until the death of his son, supposedly by accident, when he was left in the settlers’ care. In revenge, Chocorua killed the family of the man who was supposed to care for his son. The settlers then pursued Chocorua to the top of the mountain where he cast a curse upon them just before leaping to his death.